Yusha Hill and Yusha Prophet: Yusha Hill is the closest to and the highest hill of the Bosphorus. The tomb of Yusha and the mosque named after him were pleasantly situated on top of the hill overlooking the Black Sea and the Bosphorus. The Yusha Hill had been regarded as a holy place for so many centuries and different cultures and civilisations established temples there. During the Ottoman period from the mid-sixteenth century onward Yusha Hill had been one of the fruquently visited religious centres of Istanbul. Toward the and of the XVIII the century the number of visitors increased so much that Sultan Selim III. ( r. 1789 – 1808 ) prohibited holding religious ceremonies at the Hill. 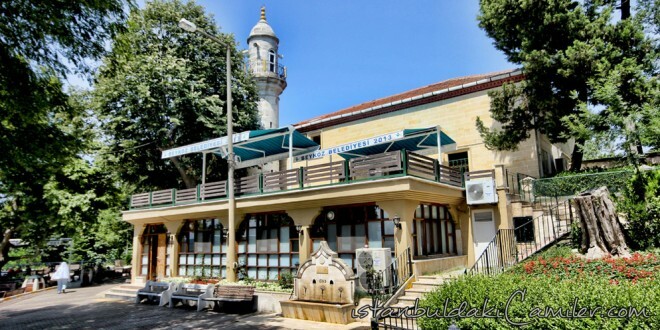 In 1755 a small mosque was built there by Grand Vizier Yirmisekiz Celebizade Mehmet Sait Pasha ( d. 1761 ) He also got a wall built around Yusha’s grave and appointed a caretaker to the tomb. The mosque was burned and then rebuilt in 1863. 1. Since he was a prophet, out of love and respect his grave was built so long and big. 2. Since its place was identified by means of a spiritual guidance, in order not to miss the grave it might be built so long and wide. 3. The ancient belief that the “giants” were living at the top of mountains may have played a part in making the grave so long, for one of the names of this hill was “the Giant Mountain” According to a story, Yusha prophet Musa, died there and buried on that hill which was named afher him. According to another story, the name YESU meaning “saviour” in Phoenician was given to the hill by the Phoenicians since it was first hill that could be seen from the Black Sea.